Schickler Tagliapietra begins preliminary design for the new IACC 90 foot race yachts. The goal of this work is to position the design office out in front of this class, ready to make valuable performance gains in the short design cycle available. It also lays the groundwork for CFD analyses, but because the final details of the class remain under debate, a number of key research areas have been anticipated. Utilizing parametric modeling techniques, the preliminary design can be prepared and updated as more information becomes available. Preliminary dimensions: Length overall 27.4 metres; Waterline length 25.7 metres; Beam 4.5 metres; Draft 6.5 metres; Displacement 17 tonnes; Sail Area upwind 490 sq metres. With extensive experience designing state-of-the-art canting and lifting keel systems, Schickler Tagliapietra is poised to apply highly evolved engineering concepts and techniques to the highest level of inshore racing in the yachting world. The overall length and draft of this yacht have been chosen based on Brad Butterworth saying that the next IACC rule will be "like a box rule" and the intent to speed the boats up considerably, therefore a vastly improved displacement/length ratio (DLR) has been targeted. The hull form itself has been totally parametrically generated and improved through several iterations toward a balance between easily driven planing off the wind and ultra-high pointing. Doug Schickler says: We think a lot of the cup boat "heritage" will apply in the future. The boats will be more exciting, but not altogether different. At higher wind speeds they will plane. For this reason they will be wider, though not wide like an IMOCA. They will still rely on heel for upwind power, no matter how deep the keel. The bow profile is the result of pushing to the maximum dimension of box rule length, while eliminating all extraneous material. Notice the way the deck forward conforms to the jib shape. The minimum drag appendage package has been established based on the idea that the race course and boats will be altered to make downwind performance of far greater importance. 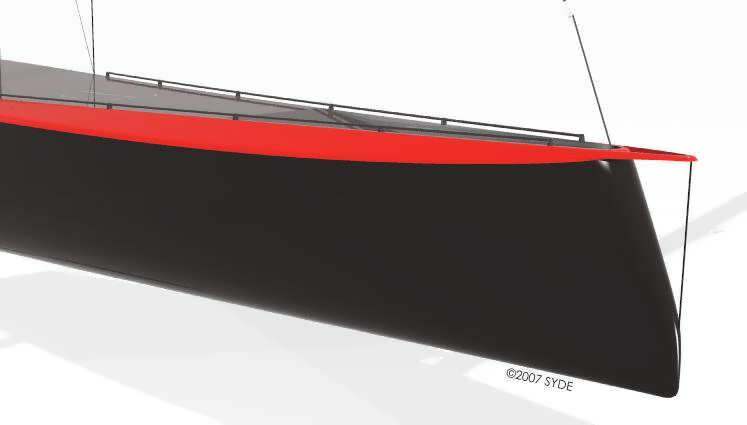 Focusing more on downwind performance has come from a consensus desire to make the racing more exciting.The possibility of two rudders has been accounted for in the preliminary design; at this stage, the choice of one, or two rudders is not clear and is, obviously, dependent on beam. Doug Schickler explains: I have this theory of "time to dominance", which says that in match racing, with an even start, a leading position sill be established with the first 20-25 minutes. It is because this period has been upwind that boats needed to be so exceptional upwind. If the course were to be changed, so the start line becomes just a fraction of that time from the windward mark, a good chance exists for the dominant downwind boat. The close interaction of boat, rig, and sail aerodynamics already begun in the 32nd AC will be even more crucial in the 33rd. Based on previous versions of the IACC rule, it is expected that the design space in the area of spars and rigging will be fairly open. This is an excellent area for development, offering large performance gains for each design cycle completed. Schickler Tagliapietra anticipate greater latitude for mast rotation. Controlling this rotation and utilizing fairings and other movable components can create a highly tunable wing mast/sail combination. The two spreader millennium wing mast pictured is an elegant solution to the structural and aerodynamic challenges of the new class of yachts. It includes newly developed concepts for applying twist to the mast tube, thus developing a highly refined and efficient foil. David Tagliapetra says: "The mast set up, with the spreaders, is quite a nice detail. The black spar is a compression tube, as you would expect, except that it rotates on a ball joint below deck, where there is a rotation control. With the support of the 2 spreader millennium the tube is quite light and can be actively twisted. At each of the two sets of spreaders there is a hydraulic ram, which can control the amount of twist at the different heights. To do this the spreader has to be cut away and the tube passes through. 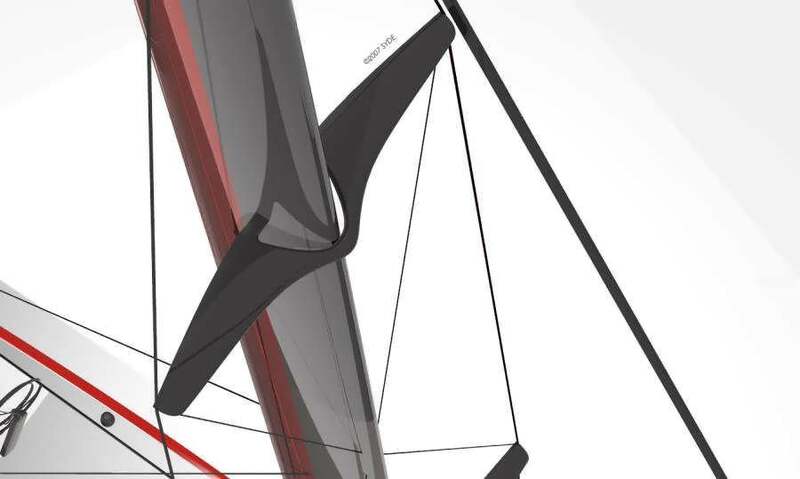 The red part is a composite fairing, which conforms to the sail; the aft edge of the red fairing is a slit from top to bottom. We bet on having carbon rigging in the new boats. This has come of age and it is time for the IACC to be out in front of other classes with materials." 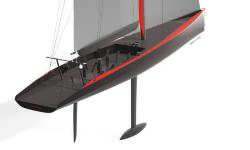 Crew numbers near 20 will be needed to provide the horsepower necessary for the powerful sailplan. Close collaboration with leading deck hardware manufacturers will prove valuable in this, as other, America's Cup cycles. Schickler Tagliapietra bring new concepts and the most advance parametric design and both mechanism and FEA verification techniques for customizing the hardware, along with the standing and running rigging, to the next level. Sail handling above and below deck will require continual development to make these larger, faster boats able to maneuver quickly without costly errors. Doug Schickler says: I think this new class will create a new development of winch for the runners. We anticipate that the sail plan will not grow quite as much as the boats do. For this reason, the existing utility, primary and main winches will do the job into the future, with a new set of ratios. Also, it is probable that pneumatics will be used not for powering the winches, but for shifting the gears and disconnects from the handles. Schickler Tagliapietra is ideally positioned to perform research, design and development of the newest generation of the IACC. The company, formerly known as SYDE, is a general partnership between Douglas Schickler and Davide Tagliapietra. 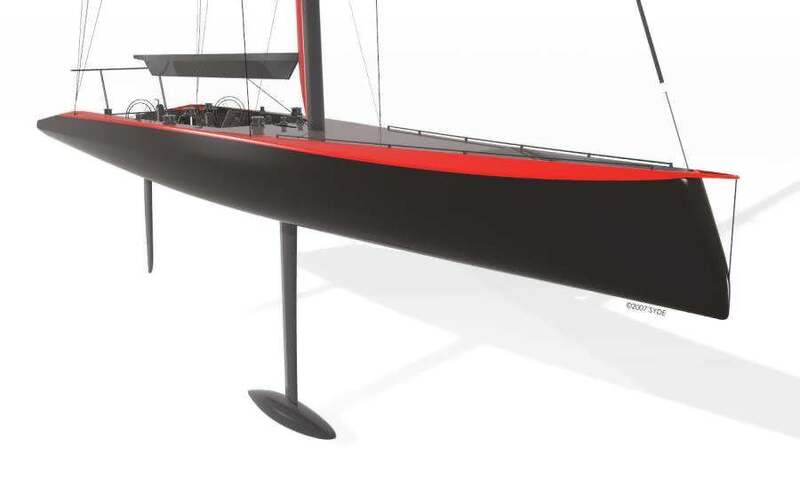 With a combined yacht design experience of 20 years, they draw on experience with a wealth of race boats – from mini to IMOCA, and from VO60/70 to America's Cup v4 and v5. They operate from an office in Amsterdam, Holland and from Valencia, Spain.